Coffee aficionados, do you love your French press coffee but hate the clean-up fuss that goes along with it? We may have an alternative for you: the pour-over method. Many of us have this notion that coffee is decidedly Italian. Or French. Or perhaps Turkish. But the pour-over method comes from (drum roll please) Japan! It kind of makes sense—the Japanese put painstaking detail into their food and drink. Why wouldn’t they know how to make a fine cup of joe? So, here’s the skinny: if you have the patience of a young child in a candy store, you should probably stick to your Krups. This isn’t a push-button-and-go process, so maybe save it for a weekend brew. You need a certain kind of carafe and kettle, good beans, a quality grinder, and the patience to wait while small servings of water brew the grounds. The narrow spout produces a thin, precise stream, and the handle brings your hand into a naturally balanced position—instead of flooding the filter and letting it drip, you deliver a measured amount of water over a period of several minutes. It might sound precious or tedious, but the control is enthralling. It's like picking up a drafting pen after only writing with Magic Markers. More important, the coffee tastes different. The flavors can be distinctive and bright, even sweet. A "bean" is really the fermented seed of a cherry-like shrub, and if coffee is roasted carefully and brewed correctly, you can taste the flower and the fruit. Kyle Glanville, co-owner of G&B Coffee and Go Get Em Tiger in Los Angeles, says the idea that individualized brewing methods are more precise is untrue. “Robots that are precision-built to do just one task are better than distracted humans,” he told the WSJ. His shops did away with pour-over completely and now only brew coffee in large batches. Despite this alarm bell, many owners refuse to give up control to The Matrix and stand by their tried and true, human-operated brewing methods. 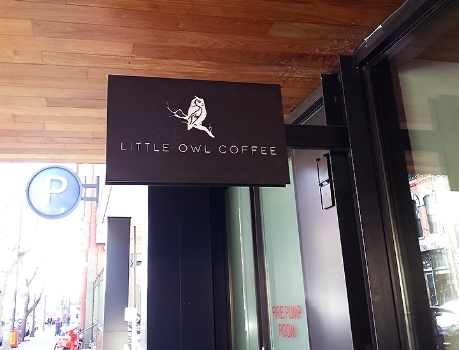 One of our favorites in lower downtown Denver (16th and Blake) is Little Owl Coffee, rated at 4.5 stars out of 5 on Yelp. One Yelp reviewer said, “I tried the pour over of the Costa Rica Terra Bella. [It] was so on point! . . . Layers of flavors and deliciousness.” They serve locally roasted, small-batch beans from Sweet Bloom and Commonwealth, so all their drinks are fresh and crisp. Another highly rated craft coffee shop in Denver is Novo, which also offers the pour-over service. My favorite Novo shop is closer to Capitol Hill on 6th Ave and Gilpin Street, but they have other locations around Denver. To learn more about their coffee, you can sign up for a cupping tour for $15 (includes a bag of beans!). If you’re on the go, be sure to grab your favorite Kup Kollar from your glove compartment, briefcase, or purse before you get to the café counter. This coffee sleeve from Koffee Kompanions will help you keep that delicious coffee hotter, longer throughout your day. Yum! One of Koffee Kompanions many products --cup wrap, cup lid, French press cozy, teapot cozy, coffee carafe cozy, and ice cream pint cozy-- insulated with 3M Thinsulate insulation (TM) to keep your beverages hot or cold longer. Have you tried the pour-over method at home or at a café? Let us know what you think in the comments!